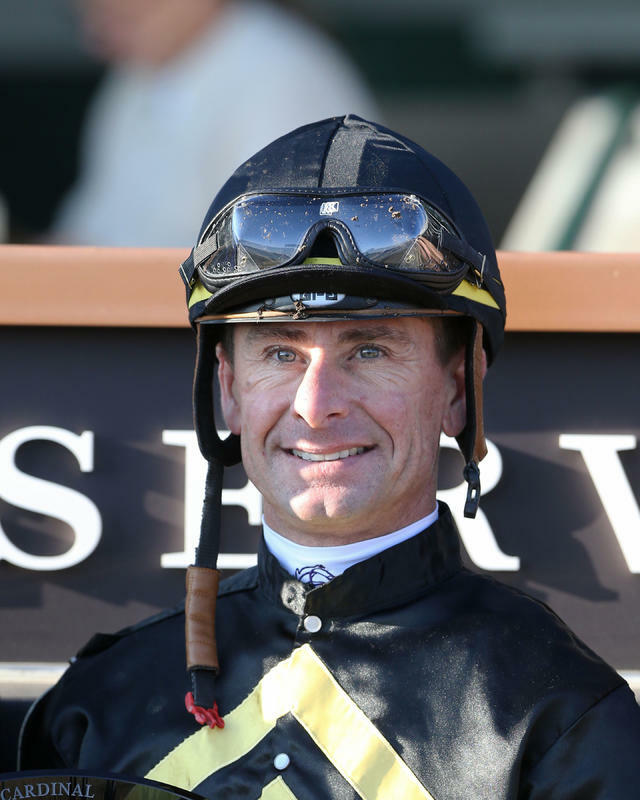 Veteran jockey Corey Lanerie leapt back into contention to defend his Fall Meet leading rider title at Churchill Downs with a four-win day on Thursday to put him two wins behind Edgar Morales in the standings with three days and 36 races remaining. Lanerie, a 16-time leading rider at Churchill Downs, trailed Morales 18-16 wins to begin Friday’s 12-race program. The 44-year-old native of Lafayette, La. has won the last six Fall Meet riding titles. On Thursday’s program, Lanerie guided home Undrafted in the fifth race and followed that with three wins in the last four races, including a victory aboard English Affair in the $100,000 Cardinal Handicap (Grade III). Spring Meet leading rider Brian Hernandez Jr. began Friday with 15 victories in the rider standings to rank third. Tyler Gaffalione’s 14 wins were in fourth while Florent Geroux and Ricardo Santana Jr. were tied for fifth with 12 wins each. The Fall Meet leading trainer’s race was just as competitive as the jockey’s race as Dallas Stewart held a slim 9-8 win margin over Hall of Fame trainer Steve Asmussen to start Friday’s action. There was a five-way tie for third between Tom Amoss, Brad Cox, Mike Maker, Kenny McPeek and Ian Wilkes with six victories each. G M B Racing and Loooch Racing Stables continued to battle it out at the top of the owner’s standings with four wins, each. Calumet Farm, Juddmonte Farms and Alex and JoAnn Lieblong were tied for third with three wins. BREEDERS’ CUP JUVNEILE RUNNER-UP KNICKS GO INSTALLED AS 2-1 MORNING LINE FAVORITE IN SATURDAY’S KENTUCKY JOCKEY CLUB – The Breeders’ Cup Juvenile (Grade I) runner-up Knicks Go was made the slight 2-1 morning line favorite when he faces 13 promising 2-year-old rivals in Saturday’s 92nd running of the $200,000 Kentucky Jockey Club (GII) at Churchill Downs. Earlier in the card, Three Chimneys Farm and Fern Circle Stables’ Breeders’ Cup Juvenile Fillies (Grade I) runner-up Restless Rider will challenge seven 2-year-old fillies as the 7-5 morning line favorite in Saturday’s 75th running of the $200,000 Golden Rod (GII). Trained by Kenny McPeek, Restless Rider scored an ultra-impressive 11 ¼ length win in the Debutante Stakes in late June at Churchill Downs and a 2 ½-length score in the Alcibiades (GI) at Keeneland in October prior to her runner-up effort in the Breeders’ Cup Juvenile Fillies. The Kentucky Jockey Club and Golden Rod are both Road to the Kentucky Derby and Kentucky Oaks point series races, respectively. The Top 4 finishers in each race will be awarded points on 10-4-2-1 scale. The Golden Rod goes as Race 9 at 4:57 p.m. (all times Eastern). The co-featured $200,000 Kentucky Jockey (GII), which attracted 14 colts and geldings, is Race 11 at 5:56 p.m. First post is 1 p.m.
BREEDERS’ CUP JUVENILE CHAMP GAME WINNER OPENS AS INDIVIDUAL FAVORITE IN FIRST DERBY FUTURE WAGER; POPULAR ‘ALL OTHERS’ OVERALL FAVORITE – Through the first day of wagering on Pool 1 of the Kentucky Derby Future Wager, the popular “All Other 3-year-olds” option opened as the odds-on 4-5 favorite over second choice Game Winner at 7-1. Other horses taking early action include impressive maiden special weight winner No. 3 Coliseum (10-1), Best Pal winner No. 9 Instagrand (15-1) and Street Sense Stakes winner No. 8 Improbable (21-1). “All Other Sires” finished Thursday as the 7-2 favorite over all offspring sired by Candy Ride (ARG) at odds of 9-2. The pool for the Sire Future Wager will close Sunday at 6:30 p.m.
DOWN THE STRETCH – There was a massive $196,438 carryover in the 20-cent Single 6 Jackpot to begin Friday’s card. The Single 6 sequence began in Race 7 at 2:24 p.m. There also is a $6,414 carryover in the Super Hi 5 which will go as Race 12 at 6:24 p.m.